This dataset was created in co-operation with the Austrian Institute of Technology for the purpose of testing person re-identification approaches. The dataset consists of images extracted from multiple person trajectories recorded from two different, static surveillance cameras. Images from these cameras contain a viewpoint change and a stark difference in illumination, background and camera characteristics. 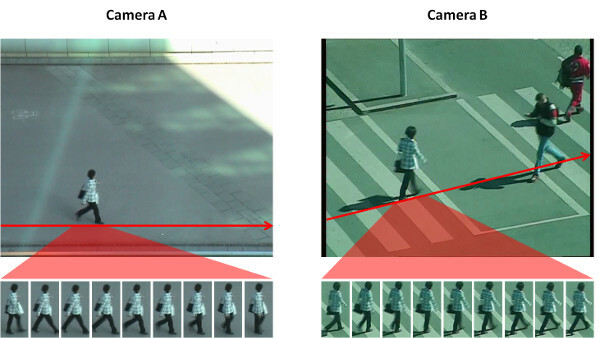 Since images are extracted from trajectories, several different poses per person are available in each camera view. We have recorded 475 person trajectories from one view and 856 from the other one, with 245 persons appearing in both views. We have filtered out some heavily occluded persons, persons with less than five reliable images in each camera view, as well as corrupted images induced by tracking and annotation errors. This results in the following setup. Camera view A shows 385 persons, camera view B shows 749 persons. 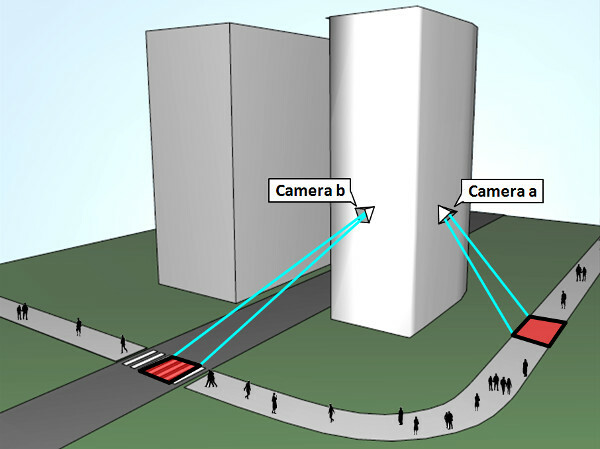 The first 200 persons appear in both camera views, i.e., person 0001 of view A corresponds to person 0001 of view B, person 0002 of view A corresponds to person 0002 of view B, and so on. The remaining persons in each camera view (i.e., person 0201 to 0385 in view A and person 0201 to 0749 in view B) complete the gallery set of the corresponding view. 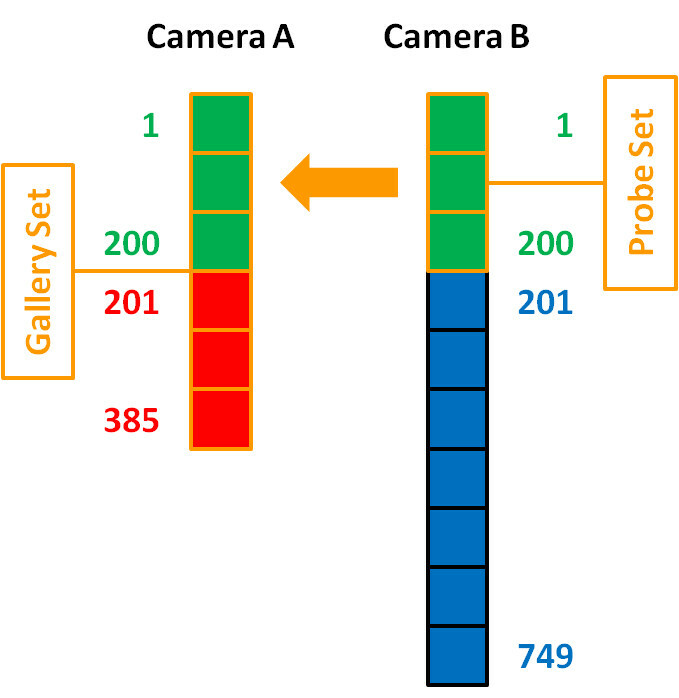 Hence, a typical evaluation consists of searching the 200 first persons of one camera view in all persons of the other view. 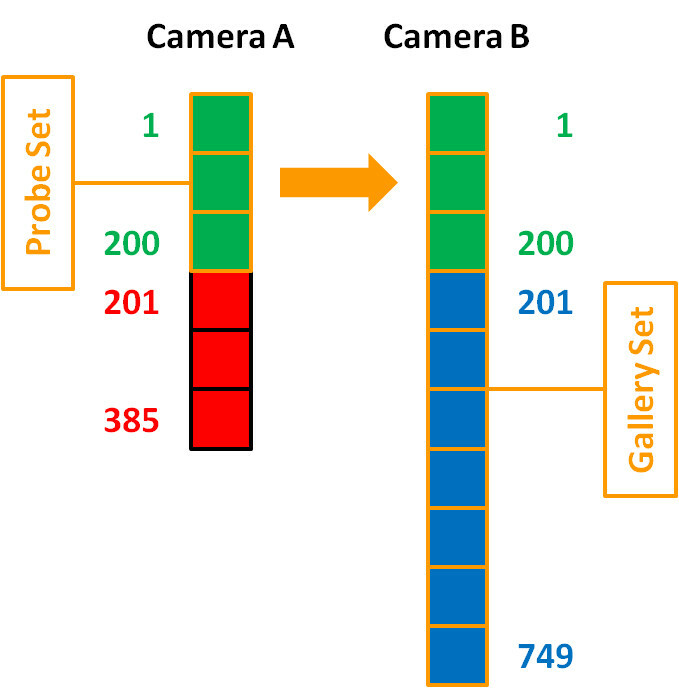 This means that there are two possible evalutaion procedures, either the probe set is drawn from view A and the gallery set is drawn from view B (A to B, used in our paper), or vice versa (B to A). See the following figures for details. Persons of view A and B. The first 200 persons appear in both views, while the remaining persons in each view complete the gallery set of that view. We provide two versions of the dataset, one representing the single-shot scenario and one representing the multi-shot scenario. The multi-shot version contains multiple images per person (at least five per camera view). The exact number depends on a person's walking path and speed as well as occlusions. 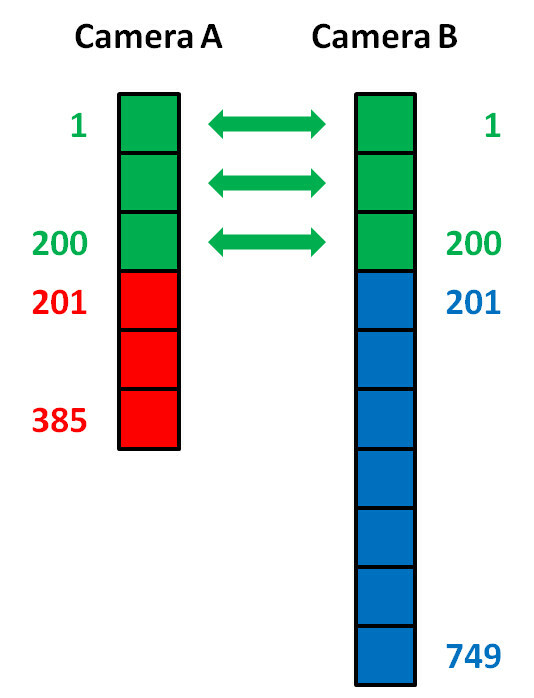 The single-shot version contains just one (randomly selected) image per person trajectory, i.e., one image from view A and one image from view B. 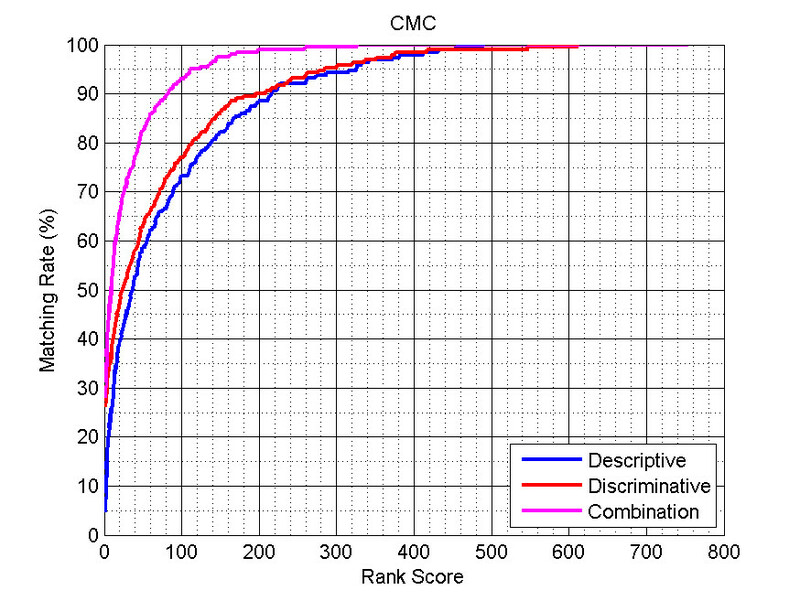 To allow a comparison to other methods, we provide results in form of Cumulative Matching Characteristic (CMC) curves on the multi-shot version of the dataset. The first image below shows the results presented in our paper, where only a roughly fitlered version of the dataset was used. For public release, we further cleaned the dataset (i.e., removal of heavily occluded persons, persons with less than five reliable images in each camera view, corrupted images, etc. ), obtaining the setup described above. 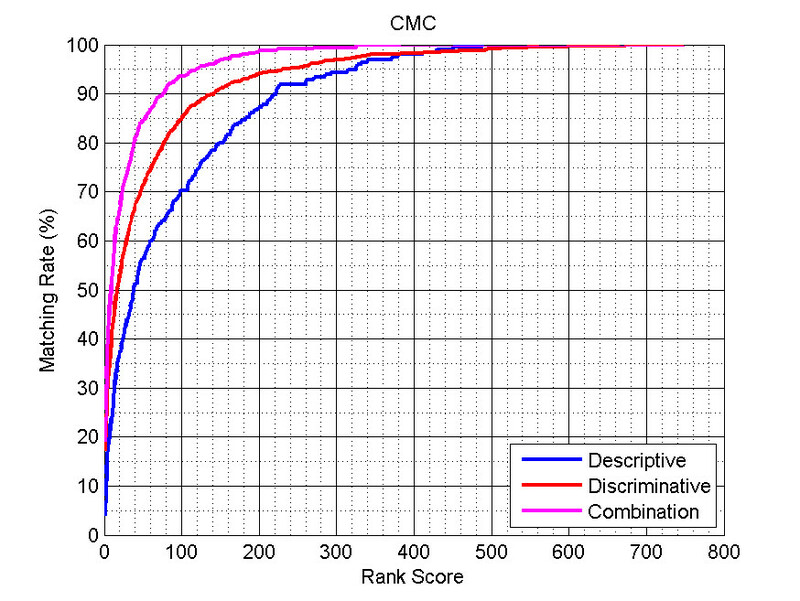 Results of our approach on this version can be seen in the second CMC. You can download the PRID 2011 dataset (cleaned version) and the results (MAT-files) below. For downloading the videos please contact Martin Hirzer or Peter M. Roth.